Today is Grandparents Day and I wanted to dedicate this post to all my grandparents, even some that I never got to meet. I am who I am today, in part, because of who they were/are. And for that, I’m truly grateful. P.S. I was inspired by this lovely blog, also a celebration of grandparents, to write today’s post. To Aline, who always saved the funny pages for me, showed me that it’s good to care for little critters like birds & raccoons, and made the best pea salad in the whole world. Thanks for letting an 8-year-old me pick out things to order from the Avon catalog and for letting me put saltine crackers in your coffee grinder just to see what would happen. To Linnie Mae, who instilled in me a love of hats, let me eat loaf bread soaked in brown gravy, and always made sure that cheesy eggs, homemade biscuits and blackberry jelly awaited me for breakfast after spending the night at your house. Thank you for calling me hunnah, for teaching me songs like Stay All Night and The Old Rugged Cross, and for giving me the spaghetti poodles. To Joe Dib, who always had a peppermint stick, some dry roasted peanuts or a cake of Juicy Fruit gum for anyone that needed it. Thank you for being the most patient man I’ve ever known, for loving the land you were raised on and turning dirt into something wonderful and beautiful. You would have loved my southern beau because you value the same things: a good dog, fishing, always having a pocket knife, not wasting words, and feisty, red-haired women. To Genia: I’m so glad you climbed out the window of your parents’ house that day and walked into town to marry a young man against your father’s wishes. Thank you for being willing to engage in a bit of rebellion that set the course of our family’s beginning. Thank you for being a devoted preacher’s wife, for making fried pies by the hundreds, for stopping to pray every day at nine o’clock. For loving my momma like she was your own daughter, instead of just your granddaughter. To Carson, who should have died in his 70s after being trampled by a 1200 pound bull, but instead lived to be 96. Thank you for always going by faith and setting an example for the rest of us. I never thought I'd mis your crack-of-dawn phone calls, but I do. I’ll always be glad for our visiting adventures, when you’d make me provide entertainment in the form of singing along with my battery operated boom box. Thank you for carrying me through the pasture when I was afraid of the cows and thank you for giving me a dollar’s worth of dimes every time I visited your house. To Richard: Thank you for choosing true love over a football scholarship. Thank you for each day since then that you’ve lived out your unwavering devotion to your beautiful bride. Thank you for never making me feel like you’d rather have had a grandson. For judging Barbie beauty contests, even if you picked the wrong winner. For sitting in a Smurfs-themed baby pool in the backyard and letting me put pink bows in your hair. Thank you for trying to protect me, even when I didn’t understand your reasoning. Thank you for loving Elvis and Ray Charles and Jimmy Carter. To Patsye: Thank you for letting me call you Patsye, instead of grandma. For indulging my every whim, for teaching me to sew and make lasagna, for entrusting me with priceless things that mean so much to you. Thank you for my beautiful hand stitched quilt, for every one-of-a-kind Easter dress you made me and playing with Barbie dolls for hours on end, for marrying your high school sweetheart and never tiring of telling and retelling the stories of your youth and for not leaving out the good parts. For Doris, who always wanted to be a Me-Maw, but settled for being a Me-me instead. Thank you for saving every stitch of my baby clothes, for teaching me that the best nighttime snack is a dish of cereal and for letting me snuggle up in bed so we could watch Three’s Company. You win the title of best back scratcher and you’re wise enough to know that Vick’s salve cures all. For Glen, who truly believes that everything is gonna be alright and reminds us of this whenever we need to hear it. Thank you for going to work at Kroger’s when it was still dark outside, every day for 40-something years. Thank you for instilling in me a love of traveling, old things, and spicy food. You’ll probably never know how many lives you’ve impacted…how many people know they can count on you…and consider themselves lucky to call you a friend (or in my case, Pe-Pa). Just like you, I cry at least once a day. To Melvin & Martha Belle, who loved my dad and made his childhood better. Even though I didn’t really get to know you, I appreciate the impact you made on his life. Melvin was a shrewd and successful Nashville businessman and Martha was a Kentucky belle in every sense of the word. To Fred & Eunice: Thank you for being such wonderful parents to your three girls and for being such fantastic grandparents to your grandchildren, including my dad. Your faith in the Lord and devotion to each other reminds us all of what’s really important in life. To Carolyn & Lee, who brought my sweet daddy into the world. You would be so proud of your children and grandchildren, who love each other very much. You are a part of that love and we’re forever grateful. 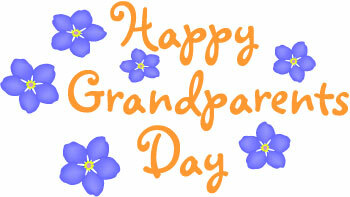 Happy Sunday to you & I hope all the grandparents out there feel special and celebrated. They are such a blessing to us. Happy Birthday F. Scott Fitzgerald!